The rain came down hard last night or as David would say, “like a tall cow on a flat rock”. Just the ticket for washing away the remaining scum of pollen. The air has been clear and free of smoke for days now, and my attitude’s been scrubbed clean as well. Happy June. Yesterday I chaperoned Pete’s class on a field trip to a lovely place called Sculptured Rocks Falls. 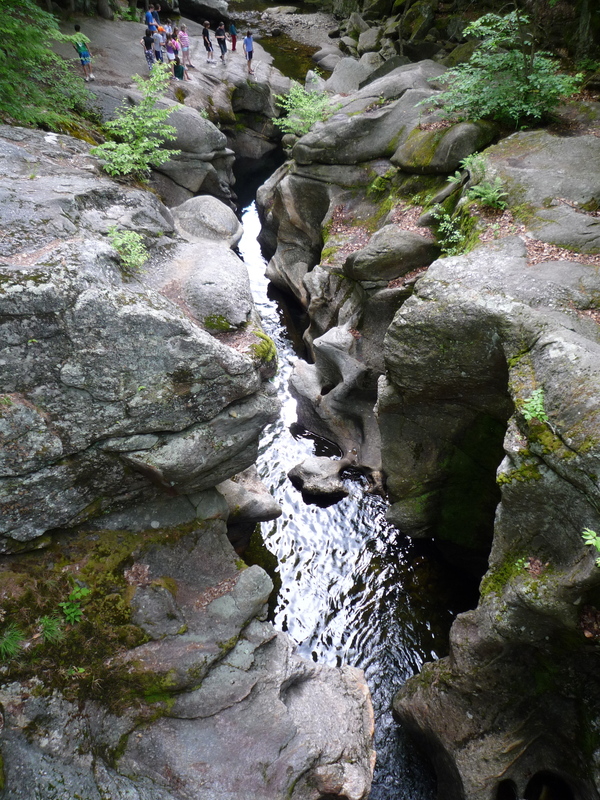 It involved a little scrambling across the stone, however I was most attentive, and managed to stay on my feet. Our group then traveled to a camp on New Found Lake. Where I grew up, in Colorado, camp was a place where you staked a tent. In New England, it refers to a summer cottage. Think 1920’s-1930’s, bare frame walls, wooden floors and bunches of bedrooms under the eaves. It is very charming and likely situated near the water. Often it is cherished by multiple generations of one fortunate family and it is the perfect place to celebrate the beginning of summer. Newfound Lake is spring fed and sparkling clean and the kids swam and boated in bright sunshine for several hours, after which we had a picnic beneath tall trees. Ice cream sandwiches were passed around and then it was time to head back to Sant Bani for an all school game of capture the flag. As I drove away from the grounds, I noticed what looked to be a bird nest in the middle of the road. 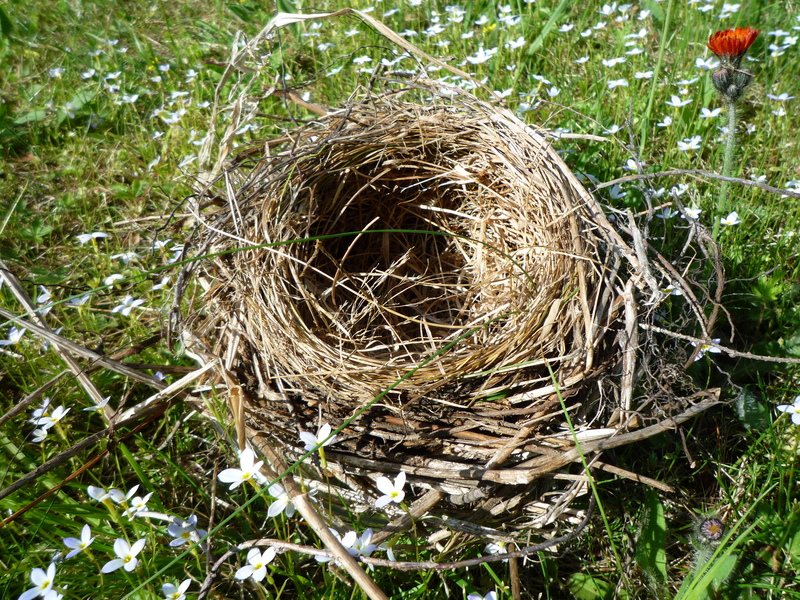 I pulled over to investigate, and sure enough; a beautifully made nest. The mud on the bottom that had secured it to a branch was yet wet, and some of the grass still green. When I told David about it, he said it probably was ripped from its perch by a marauding bird. Let’s hope the motivation was simply a territorial dispute rather than the theft of eggs. 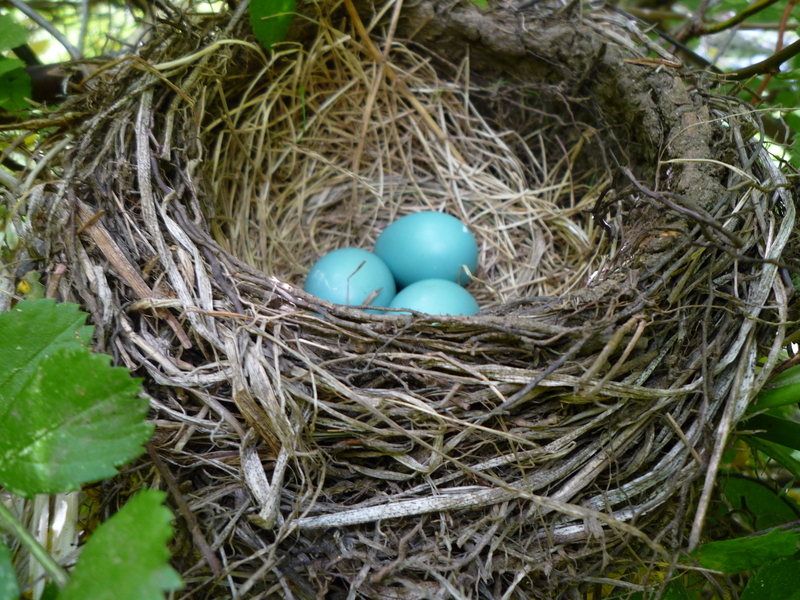 Several days ago I took the second photo of a beautiful clutch of robin eggs in a nest tucked into a wild rose bush in our upper garden. Such a magical way to start life: hatched out of a sky blue shell and nestled in a basket woven by your mother. So I’ll end today’s post with this hopeful image. On Monday I have scans and by the time of my appointment with Dr. Shaw the following Monday, I should have a better idea as to how quickly the cancer is returning. I am feeling very positive in general, yet I will await the results with some anxiety. I am not eager to start a different therapy, and remain hopeful that the cancer is also in no hurry. It isn’t always easy to stay in the moment, but I do try. Were I to focus on my worries, I might miss something; something wonderful. Like a bird nest lying in the middle of the road. I’ll bask in these days turning to weeks and months and send to you my best wishes. I’m very busy watching our hummingbird and flicker as they fly about the yard. In our tradition, eggs are a sign of rebirth and new beginnings. And birds, represent the Element of air, the cool breath of inspiration and relief. I am praying that all your worries are blown away along with the breeze. Rock falls and Linnea did not, time to try new glass slipper crizotinib in your steady feet? I’m so happy to know that your ankle had healed so well that you could chaperoned another adventurous field trip of Peter’s. I’ve never seen eggs in such a beautiful blue color. I fell in love with your photo of the nestled eggs so much that I saved it in my iphone and am using it as wallpaper. Thank you for posting it! You are so fortunate to be surrounded by the wonderful, magical, beautiful nature.